The Forgetting Game, a feature documentary produced by three recent MA alums – Russell Sheaffer (director), Pulkit Datta (producer), and Jim Bittl (producer) – will have its New York premiere this Wednesday, November 30th. The 6pm screening is part of the NewFilmmakers Series at Anthology Film Archives and follows its world premiere at Chagrin Documentary Film Festival (Ohio) where it was nominated for the Emerging Filmmaker award, and its international premiere at the Marbella International Film Festival (Spain). This year marks the 50th anniversary of the construction of the Berlin Wall, and this compelling new documentary tells the story of Beate Kernke, a 5-year-old East German girl who became the first person to be legally and peacefully transferred across the Wall in March 1963. By combining intimate interviews, historical news footage, and fascinating propaganda material, the film explores the momentous event of Beate’s transfer and traces her rollercoaster life since. The Department congratulates our recent grads for this exciting achievement and looks forward to the film’s great success. Russell Sheaffer is an experimental film and documentary maker with a strong academic background. Most recently, a short film that he co-wrote and co-directed with James Franco, Masculinity & Me, was an official selection of the 2011 Torino LGBT Film Festival and was featured in Franco’s solo exhibition, “The Dangerous Book Four Boys” in New York and Berlin. He received his Masters in Cinema Studies from NYU and his experimental shorts have screened both nationally and internationally. 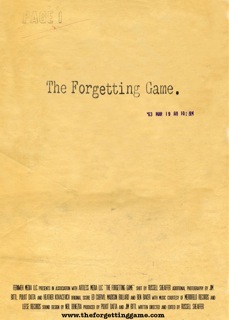 The Forgetting Game is Russell’s first feature film.